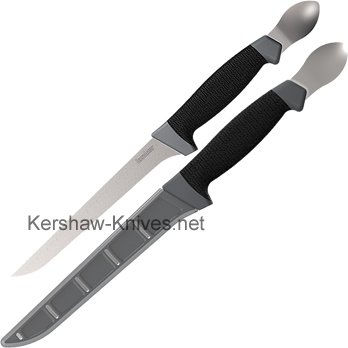 Kershaw Fillet Spoon Knife 7 inches 1243SHX. Kershaw has made your one in all knife for your fishing trips. This is not only a knife ready to fillet those fish, but also a spoon to help scoop out the guts or eat up the fish once cooked. 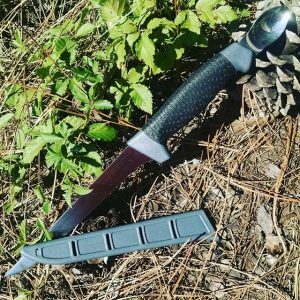 The satin blade is 7 inches long and made with 420J2 steel. The handle is made of glass filled nylon and has Kershaw's special K- Texture rubber over mold grip to make sure you get a firm grip. Have this ready on your boat for all those fish you are going to catch. This comes with a plastic sheath covering to keep this blade protected when not in use.